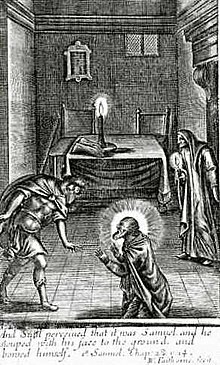 Illustration portraying a scene from the Bible wherein the Witch of Endor, frightened, unsuccessfully tried to use a necromantic ritual to conjure the spirit of Samuel at the behest of Saul; from the frontispiece of Sadducismus Triumphatus (1681) by Joseph Glanvill. Necromancy (/ˈnɛkrəmænsi/) is a practice of magic involving communication with the dead – either by summoning their spirit as an apparition or raising them bodily – for the purpose of divination, imparting the means to foretell future events or discover hidden knowledge, to bring someone back from the dead, or to use the dead as a weapon, as the term may sometimes be used in a more general sense to refer to black magic or witchcraft. The word "necromancy" is adapted from Late Latin necromantia, itself borrowed from post-Classical Greek νεκρομαντεία (nekromanteía), a compound of Ancient Greek νεκρός (nekrós), "dead body", and μαντεία (manteía), "divination by means of"; this compound form was first used by Origen of Alexandria in the 3rd century AD. The Classical Greek term was ἡ νέκυια (nekyia), from the episode of the Odyssey in which Odysseus visits the realm of the dead and νεκρομαντεία in Hellenistic Greek, rendered as necromantīa in Latin, and as necromancy in 17th-century English. Early necromancy was related to – and most likely evolved from – shamanism, which calls upon spirits such as the ghosts of ancestors. Classical necromancers addressed the dead in "a mixture of high-pitch squeaking and low droning", comparable to the trance-state mutterings of shamans. Necromancy was prevalent throughout Western antiquity with records of its practice in ancient Egypt, Babylonia, Greece and Rome. In his Geographica, Strabo refers to νεκρομαντία (nekromantia), or "diviners by the dead", as the foremost practitioners of divination among the people of Persia, and it is believed to have also been widespread among the peoples of Chaldea (particularly the Sabians, or "star-worshipers"), Etruria and Babylonia. The Babylonian necromancers were called manzazuu or sha'etemmu, and the spirits they raised were called etemmu. The oldest literary account of necromancy is found in Homer’s Odyssey. Under the direction of Circe, a powerful sorceress, Odysseus travels to the underworld (katabasis) in order to gain insight about his impending voyage home by raising the spirits of the dead through the use of spells which Circe has taught him. He wishes to invoke and question the shade of Tiresias in particular; however, he is unable to summon the seer's spirit without the assistance of others. The Odyssey's passages contain many descriptive references to necromantic rituals: rites must be performed around a pit with fire during nocturnal hours, and Odysseus has to follow a specific recipe, which includes the blood of sacrificial animals, to concoct a libation for the ghosts to drink while he recites prayers to both the ghosts and gods of the underworld. Practices such as these, varying from the mundane to the grotesque, were commonly associated with necromancy. Rituals could be quite elaborate, involving magic circles, wands, talismans, and incantations. The necromancer might also surround himself with morbid aspects of death, which often included wearing the deceased's clothing and consuming foods that symbolized lifelessness and decay such as unleavened black bread and unfermented grape juice. Some necromancers even went so far as to take part in the mutilation and consumption of corpses. These ceremonies could carry on for hours, days, or even weeks, leading up to the eventual summoning of spirits. Frequently they were performed in places of interment or other melancholy venues that suited specific guidelines of the necromancer. Additionally, necromancers preferred to summon the recently departed based on the premise that their revelations were spoken more clearly. This timeframe was usually limited to the twelve months following the death of the physical body; once this period elapsed, necromancers would evoke the deceased’s ghostly spirit instead. While some cultures considered the knowledge of the dead to be unlimited, ancient Greeks and Romans believed that individual shades knew only certain things. The apparent value of their counsel may have been based on things they knew in life or knowledge they acquired after death. Ovid writes in his Metamorphoses of a marketplace in the underworld where the dead convene to exchange news and gossip. Though Mosaic Law prescribed the death penalty to practitioners of necromancy (Leviticus 20:27), this warning was not always heeded. One of the foremost examples is when King Saul had the Witch of Endor invoke the spirit of Samuel, a judge and prophet, from Sheol using a ritual conjuring pit (1 Samuel 28:3–25). However, the so-called witch was shocked at the presence of the real spirit of Samuel for in I Sam 28:12 it says, "when the woman saw Samuel, she cried out in a loud voice." Samuel questioned his reawakening asking, "Why hast thou disquieted me?" Saul did not receive a death penalty (his being the highest authority in the land) but he did receive it from God himself as prophesied by Samuel during that conjuration – within a day he died in battle along with his son Jonathan. Some Christian writers later rejected the idea that humans could bring back the spirits of the dead and interpreted such shades as disguised demons instead, thus conflating necromancy with demon summoning. Caesarius of Arles entreats his audience to put no stock in any demons or gods other than the Christian God, even if the working of spells appears to provide benefit. He states that demons only act with divine permission and are permitted by God to test Christian people. Caesarius does not condemn man here; he only states that the art of necromancy exists, although it is prohibited by the Bible. On the other hand, some Christians believe that necromancy is real (along with other facets of the occult "magic") but God has not suffered Christians to deal with those spirits (Deuteronomy 18:14). Still others believe the phantom of Samuel to be a trick, like the hoax séances conducted by many early 20th century illusionist spiritualists, which fooled those recording the events of Samuel's life. Many medieval writers believed that actual resurrection required the assistance of God. They saw the practice of necromancy as conjuring demons who took the appearance of spirits. The practice became known explicitly as maleficium, and the Catholic Church condemned it. Though the practitioners of necromancy were linked by many common threads, there is no evidence that these necromancers ever organized as a group. Medieval necromancy is believed[by whom?] to be a synthesis of astral magic derived from Arabic influences and exorcism derived from Christian and Jewish teachings. Arabic influences are evident in rituals that involve moon phases, sun placement, day and time. Fumigation and the act of burying images are also found in both astral magic and necromancy. Christian and Jewish influences appear in the symbols and in the conjuration formulas used in summoning rituals. Practitioners were often members of the Christian clergy, though some nonclerical practitioners are recorded. In some instances, mere apprentices or those ordained to lower orders dabbled in the practice. They were connected by a belief in the manipulation of spiritual beings – especially demons – and magical practices. These practitioners were almost always literate and well educated. Most possessed basic knowledge of exorcism and had access to texts of astrology and of demonology. Clerical training was informal and university-based education rare. Most were trained under apprenticeships and were expected to have a basic knowledge of Latin, ritual and doctrine. This education was not always linked to spiritual guidance and seminaries were almost non-existent. This situation allowed some aspiring clerics to combine Christian rites with occult practices despite its condemnation in Christian doctrine. Will manipulation affects the mind and will of another person, animal, or spirit. Demons are summoned to cause various afflictions on others, "to drive them mad, to inflame them to love or hatred, to gain their favor, or to constrain them to do or not do some deed." Illusions involve reanimation of the dead or conjuring food, entertainment, or a mode of transportation. Knowledge is allegedly discovered when demons provide information about various things. This might involve identifying criminals, finding items, or revealing future events. Circles were usually traced on the ground, though cloth and parchment were sometimes used. Various objects, shapes, symbols, and letters may be drawn or placed within that represent a mixture of Christian and occult ideas. Circles were believed to empower and protect what was contained within, including protecting the necromancer from the conjured demons. Conjuration is the method of communicating with the demons to have them enter the physical world. It usually employs the power of special words and stances to call out the demons and often incorporated the use of Christian prayers or biblical verses. These conjurations may be repeated in succession or repeated to different directions until the summoning is complete. Sacrifice was the payment for summoning; though it may involve the flesh of a human being or animal, it could sometimes be as simple as offering a certain object. Instructions for obtaining these items were usually specific. The time, location, and method of gathering items for sacrifice could also play an important role in the ritual. The rare confessions of those accused of necromancy suggest that there was a range of spell casting and related magical experimentation. It is difficult to determine if these details were due to their practices, as opposed to the whims of their interrogators. John of Salisbury is one of the first examples related by Richard Kieckhefer, but as a Parisian ecclesiastical court record of 1323 shows, a "group who were plotting to invoke the demon Berich from inside a circle made from strips of cat skin" were obviously participating in what the Church would define as "necromancy". Herbert Stanley Redgrove claims necromancy as one of three chief branches of medieval ceremonial magic, alongside black magic and white magic. This does not correspond to contemporary classifications, which often conflate "nigromancy" ("black-knowledge") with "necromancy" ("death-knowledge"). In the wake of inconsistencies of judgment, necromancers and other practitioners of the magic arts were able to utilize spells featuring holy names with impunity, as any biblical references in such rituals could be construed as prayers rather than spells. As a consequence, the necromancy that appears in the Munich Manual is an evolution of these theoretical understandings. It has been suggested that the authors of the Manual knowingly designed the book to be in discord with ecclesiastical law. The main recipe employed throughout the Manual used the same religious language and names of power alongside demonic names. An understanding of the names of God derived from apocryphal texts and the Hebrew Torah required that the author of such rites have at least a casual familiarity with these sources. Within the tales related in occult manuals are found connections with stories from other cultures' literary traditions. For instance, the ceremony for conjuring a horse closely relates to the Arabic One Thousand and One Nights and French romances; Chaucer’s The Squire's Tale also bears marked similarities. This becomes a parallel evolution of spells to foreign gods or demons that were once acceptable, and frames them into a new Christian context, albeit demonic and forbidden. As the material for these manuals was apparently derived from scholarly magical and religious texts from a variety of sources in many languages, the scholars who studied these texts likely manufactured their own aggregate sourcebook and manual with which to work spells or magic. In the notebooks of Leonardo da Vinci, it is stated that "Of all human opinions that is to be reputed the most foolish which deals with the belief in Necromancy, the sister of Alchemy, which gives birth to simple and natural things." In the present day, necromancy is more generally used as a term to describe the pretense of manipulation of death and the dead, often facilitated through the use of ritual magic or some other kind of occult ceremony. 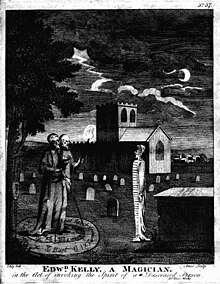 Contemporary séances, channeling and Spiritualism verge on necromancy when supposedly invoked spirits are asked to reveal future events or secret information. Necromancy may also be presented as sciomancy, a branch of theurgic magic. Necromancy appears in many works of fantasy fiction, often by villains who use it to raise armies of zombies the heroes must slay. Necromancy is a popular plot element in video games, such as Diablo 2, Diablo 3, The Elder Scrolls IV: Oblivion, The Elder Scrolls V: Skyrim, Shadow of Mordor, Shadow of War, The Elder Scrolls Online, World of Warcraft, Magic the Gathering, Gothic and Mortal Kombat, as well as in the tabletop role-playing game Dungeons & Dragons. In the film Army of Darkness (1992) the protagonist Ash fights a skeletal army raised by the Necronomicon. Necromancer is the main protagonist of Tony Vilgotsky's novel Shepherd of the Dead. In the band Sundara Karma’s second album “Ufilitas’ Alphabet” there is a song entitled “Duller Days” which includes the line “A Necromance as common as the flu”. The 2018 fiction book "A Necromancer's Cult", by Michelle Moffat, describes the personal sacrifices involved in a ritual to bring a woman back from the dead. ^ Jones, Daniel (2003). Roach, Peter; Hartman, James; Setter, Jane (eds.). Cambridge English Pronouncing Dictionary (16th ed.). Cambridge University Press. ISBN 0-521-81693-9. ^ "necromancy". Oxford Dictionary of English (3rd rev. ed.). Oxford, UK: Oxford University Press. August 2010. ^ "necromancy, n.". Oxford English Dictionary (OED) (3rd ed.). Oxford, UK: Oxford University Press. September 2003. ^ cf. Tanakh, Torah, Devarim 18:9–12. ^ cf. Tanakh, Torah, Vayikra 20:27. ^ cf. Tanakh, Nevi'im, Shmu'el Aleph 28:3–25. ^ William Godwin (1876). "Lives of the Necromancers". p. 18. ^ Kieckhefer 2011, pp. 165–166. ^ Kieckhefer 2011, pp. 153–154. ^ Kieckhefer 2011, pp. 159–162. ^ Leonardo. Notebooks, Volume 2, Chapter XIX, Section III:1213. ^ "Supernatural Chicago". Excalibur Nightclub. Retrieved April 18, 2013. Cook, D. (1989). Breault, M (ed.). Player's Handbook. Advanced Dungeons & Dragons, 2nd Edition. Lake Geneva, WI: TSR. ISBN 978-0-88038-716-3. Guiley, R. E. (2006). "Necromancy". The Encyclopedia of Magic and Alchemy. New York City, NY: Infobase Publishing. pp. 215–216. ISBN 978-0-8160-6048-1. Homer (1900) [c. 700 BCE]. The Odyssey. S. Butler, trans. London, UK: Longmans, Green & Co. OCLC 4862683. Johnson, M. M. (2004). "Necromancy". In Golden, R. M (ed.). Encyclopedia of Witchcraft: The Western Tradition. Santa Barbara, CA: ABC-CLIO. pp. 808–809. ISBN 978-1-57607-243-1. Kors, A. C. & Peters, E., eds. (2001). Witchcraft in Europe 400–1700: A Documentary History (2nd ed.). Philadelphia, PA: University of Pennsylvania Press. ISBN 978-0-8122-1751-3. Kurtz, S. (1995). Forbeck, M (ed.). The Complete Book of Necromancers. Advanced Dungeons & Dragons, 2nd Edition. Lake Geneva, WI: TSR. ISBN 978-0-7869-0106-7. Leonardo da Vinci (1970) [1452–1519]. Richter, J. P (ed.). The Notebooks of Leonardo da Vinci. New York City, NY: Dover Publications. ISBN 978-0-486-22573-9. Ovid (1717) [8 CE]. Garth, S (ed.). Metamorphoses. J. Addison, W. Congreve, S. Croxall, J. Dryden, L. Eusden, J. Gay, A. Maynwaring & N. Tate, trans. London, UK: Jacob Tonson. OCLC 85877585. Rowling, J. K. (2008). The Tales of Beedle the Bard. London, UK: Children's High Level Group. ISBN 978-0-545-12828-5. Spence, L. (1920). "Necromancy". An Encyclopædia of Occultism. London, UK: Routledge. pp. 286–290. OCLC 264589119. Strabo (1889–1893) [20 BCE – 23 CE]. Hamilton, H. C.; Falconer, W (eds.). Geography. London, UK: George Bell & Sons. OCLC 693763975. Tweet, J.; Cook, M. & Williams, S. (2003). Martin, J. & Rateliff, J (eds.). Player's Handbook: Core Rulebook I. Dungeons & Dragons v3.5. Renton, WA: Wizards of the Coast. ISBN 978-0-7869-2886-6. Bacon, R. (1988) [c. 1260–1280]. MacDonald, M (ed.). De Nigromancia. Berkeley Heights, NJ: Heptangle Books. ISBN 978-0-935214-10-9. Archived from the original on 2014-08-23. Dubray, C. (1911). "Necromancy". Catholic Encyclopedia. New York City, NY: Robert Appleton Company. Godwin, W. (1834). Lives of the Necromancers. London, UK: F. J. Mason. OCLC 2657815. Halliday, W. R. (1913). "Chapter XI: Necromancy". Greek Divination: A Study of Its Methods and Principles. London, UK: Macmillan. pp. 235–245. OCLC 25019974. Monroe, A.; Edwards, T., eds. (2010) . Full Guide to Becoming a Real Wizard, Witch or Necromancer; from "The Scripts of Osari the Wise". New York City, NY: Library Tales/CreateSpace. ISBN 978-1-4499-6763-5. Vulliaud, P. (1923). La Kabbale Juive: Histoire et Doctrine—Essai Critique (in French). Paris, France: Émile Nourry. OCLC 22318758. Wikimedia Commons has media related to Necromancy. "Necromancer". TV Tropes. – Includes a list of works of modern popular media that feature necromancy.